Sitting in the square of the small town Cabanaconde, we waited for the start of our Colca Canyon trek. It was a quiet, hot day and we longed to get started so we could reach the much cooler bottom of the canyon. Across the way a potato market was underway. Traditionally dressed women sold their potatoes and then loaded them into all manner of vehicles. The woman on the right is carrying a baby in the red patterned bundle on her back. I have no idea how they tie the fabric so that the baby doesn’t fall! I’m just starting to get into our Cabanaconde and Colca Canyon photos and storytelling. 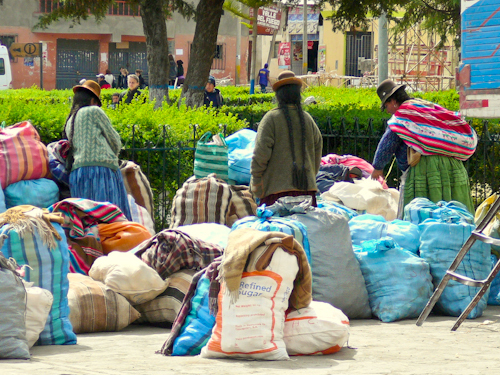 We were in Cabanaconde for several days and yet somehow missed this potato market. Seriously, I spent 3 weeks in Peru and never felt like there was enough potato variety in my diet!